Mon, Jul 9, 2018, 10:03 am SL Time, ColomboPage News Desk, Sri Lanka. 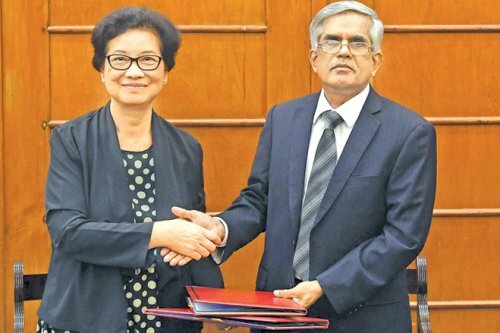 July 09, Colombo: The Asian Development Bank (ADB) has granted USD 9.5 million through the Women Entrepreneurs Finance Initiative (We - Fi) to support the ongoing Small and Medium Enterprises (SMEs) - Line of Credit. Country Director of the ADB's Sri Lanka Resident Mission Sri Widowati signed the grant agreement on behalf of ADB while Dr. R.H.S. Samaratunga, Secretary to the Treasury, Ministry of Finance, signed for the Government of Sri Lanka. Financial inclusion for SMEs is important to realize the development objectives of the Government such as promoting exports, generating jobs and increasing per capita income. As such, the Government mobilized USD 100 million from ADB in 2016, with the objective of financing SMEs and having successfully disbursed these funds, another USD 75 million was mobilized from ADB, in 2018 as an additional financing to further enhance the benefits to the SME sector. Since women led SMEs face significant difficulties in accessing finance, a grant of USD 12.55 million will be mobilized from the Women Entrepreneurs Finance Initiative (We - Fi) , on top of the loan funds for encouraging women entrepreneurs. Out of the grant of USD 12.55 million, USD 9.5 million will be provided to the Women entrepreneurs on grant basis through Participating Financial Institutions. The balance amount of the grant will be used for Technical assistance and administrative cost. Additional incentives will be provided for women who complete business skills training and for women in Uva, Sabaragamuwa, Northern & Eastern provinces. The Ministry of Finance and Mass Media will continue to be the Executing Agency of the project, as in the ongoing SME Projects funded by ADB.